Step 4: Enjoy wearing a world of different looks every day to suit your style and outfit ! There are now also ROSA EARRINGS which work in much the same way and have similar interchangable charms and gemstones which slide on on off. Each chain is especially chosen to be strong and durable enough to take our charms which are solid, not hollow, higher quality, and consequently, heavier than many mass produced charms on the market. There are openwork chains and chunky chains, and there are double chains too. Necklace chains are available in lengths of 20, 22 and 24 inches as standard. We find that mostly these simply slip over your head which makes them easy to put on. Because our chains fasten at the front using our Rosa ring, any length shorter than 20 can make them functionally hard to do up. This doesn't mean you can't have a 16 inch or 18 inch chain - you can - but these come with an additional back fastening clasp (our signature "S" clasp) so you can fasten them in a traditional manner rather than at the front. Bracelet chains come in standard 7.5 and 8 inches which we find are suitable for most wrists. There is no requirement for a clasp as the Rosa ring performs this function. Other lengths of chain are available by special order. We can make any length specially for you. You may also choose to have any chain we stock modified by adding in integral gemstones or other accents. Our standard ROSA chains are machine made to a high quality, but we can also hand make a bespoke chain to your specification. All of our chains are accompanied by a hallmark tag (except where the design of the chain makes this impossible). All our standard chains are guaranteed 925 sterling silver. Where gold chains are supplied, the relevant assay mark or purity will be visible as appropriate. We don't supply silver plating or base metal chain for Rosa as we cannot guarantee durability or quality. If you have problems with dexterity, our "S" clasps are a perfect answer - easy to do up and undo, but secure. If you prefer, we can also offer magnetic sterling silver clasps at additional cost - please ask about these if you require one. Our pendants for Rosa necklaces are carefully chosen in a variety of rainbow colours so that you can find something to match every outfit. We have silver pendants and gemstone pendants. Usually our pendants are larger than an inch (25mm) in length and make the focal point of a necklace, though they can also be used with a bracelet if you like larger charms for your wrist. We've searched all around the world for our silver charms, and many of them have been found over 30 years of searching and collecting, so they come to you with their own special stories. 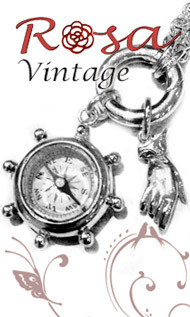 Our vintage charms are different to the usual suspects out there and are carefully cast from antique or vintage originals, so some are quirky and unusual, imbued with meaning, history and individuality. You can also buy a range of silver charms which can be personalised in different ways to make unique memorable charms that are special to their owners. You can ask us to make you a unique bespoke charm or pendant to your own design in any metal, or with any gemstone you choose. All you need to do is contact us to discuss your bespoke pendant or charm for your Rosa necklace or bracelet. From time to time, we'll be offering original vintage charms and limited one off charms and pendants which can be added to ROSA. These have included beautiful antique silver compasses, 18th century carved jade and african bone tribal pendants. Sign up to our newsletter to be the first to know about vintage and limited items - if you love something you see, act fast because these pieces don't stick around long ! The majority of pendants and charms for bracelets and necklaces sold by large companies are manufactured in the Far East. All our pendants and charms without exception are made in our UK workshop. We don't use overseas labour or workshops. We employ British jewellers qualified to degree level and apprentices on British wages. This means that every charm is individually produced with care, cleaned and polished by hand and hallmarked by the London Assay Office. You'll find that even the charms are under the legal weight for hallmarking are hallmarked too (unless they will be damaged by the hallmarking process). Most of our charms are offered simply as the vintage originals would have been, without the embelishement of diamonds or other stones. However, if you wish, some of our charms can be set with your choice of birthstones or any other stones you want - please contact us for details. We don't sell diamante embellished charms or pendants. In many cases its just as cheap for us to set tiny diamonds and we do this in the UK. We don't sell enammelled charms as we find they lack durability in the long term. 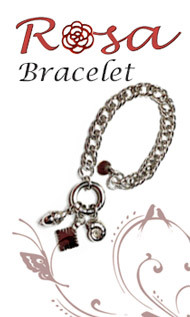 We don't sell charms on lobster clasps like some manufacturers as we find they are not safe. Each charm is attached to a silver ring which is soldered closed, not simply closed by tension alone. Some of our silver charms are surface treated with an oxidising agent to make them dark grey or black. In time, the black oxidisation will wear back to a pale grey. If you want your silver charms reoxidising, you can send them back to us and we can do this for you. Our charm braclets work on the same system as the Rosa necklace. Choose a chain you like; add a ROSA ring (if you don't already have one); and then, if you wish, add charms to your bracelet. ROSA charm bracelets aren't about cramming on an endless amount of charms in one go - they are about choosing favourites for everyday and special days. Unlike certain charm bracelet brands we could mention, with the ROSA system you never need stop collecting - the only limit to the charms you can wear is your choices. But what makes ROSA really special is, because all our pieces are handmade, you can even commission your own charms to add to your bracelet, and make it truly your own. The ROSA interchangeable charm earrings are designed around sterling silver hoops which are available in small, medium and large sizes onto which you can simply slip our drops to suit your mood. You can choose from silver charms that compliment your Rosa neclkace or bracelet, or have little gemstone drops, pearls or any of our silver charms which are designed to fit the earrings. 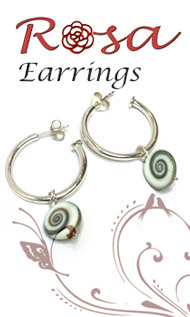 The hoops may also be worn alone for a simple look. All our hoops, charms and gem and pearl fittings are available on yellow or white gold to order. We can also effect any repairs you might need to your Rosa , or indeed any other jewellery you own. If you have favourite charms we can try and adapt those for ROSA for you too. We recommend you keep your Rosa chain, and its charms in seperate boxes when you aren't wearing them. This will stop them from scratching, and also keep them from becoming dirty and tarnishing. If you do feel your charms need cleaning or polishing , we recommend you do this with dry silver wipes (available HERE) and wash them with warm soapy water afterwards. When getting dressed, apply perfume, hairspray and any body lotion well before you put your jewellery on. Leave to dry and, only when you are finshed applying products, put your jewellery on. Chemicals in perfume, haisrpay, spray or wipe on tan and body lotion can damage precious metals, pearls and stones, so it pays to keep them as far away as you can from your precious pieces ! If your jewellery becomes very tarnished or dirty you can return it to us for a clean and polish.